Poster Design for 2012 Cherry Blossom Festival promises Lucy, in the Sky, with Diamonds. The poster for the 2012 Cherry Blossom Festival is out today, and aside from the fact that it’s beautiful, it looks like it was heavily influenced by the Beatles Yellow Submarine. 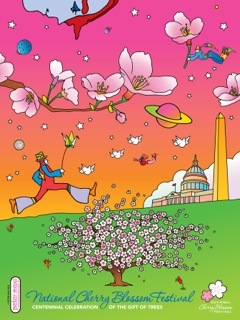 The poster is for sale, at $100, at the National Cherry Blossom Festival store, and was designed by Peter Max. Hm. Cherry Blossom Festival + LSD = ?